Rocket Pictures - 90 min. Cast: Nicholas Eadie, Perry Piercy, Elizabeth Hawthorne, Sophia Hawthorne, Craig Hall, Ian Mune, Theresa Healey. Screenplay: Mark Beesley; Director of Photography: Leon Narbey; Editor: Margot Francis; Production Design: Gary MacKay; Original Music: Dean Savage; Producer: Steve Sachs; Director: Mark Beesley. Dean is threatening to firebomb his ex-girlfriend's wedding. Mickey is filling the garage with stolen goods - again, and pierced teenage daughter, Leesa, is an accident waiting to happen on the family's beloved Triumph motorbike. An unconventional tough family, battling to survive with humour and love, in a world of motor bikes, rock 'n' roll, classic cars and alcohol. This is a family that you probably would not want next door, but they are fun to watch, and they have their ways of holding family together. Worth a watch. R4 PAL DVDs are available from NZ sources for about $30nz and Australian sources for about $20au. The only extra is the trailer. There are no subtitles. 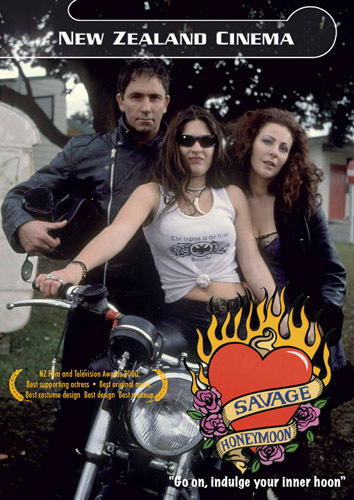 In June 2010 it was re-issued, in New Zealand, as an R0 PAL DVD with no extras, selling for under $15nz. It is presented 1.80:1 with 2.0 digital stereo sound.